A self-represented family law litigant anxiously prepares for a hearing, which can resolve months, if not years, of anxiety, and determine the litigant’s financial and family affairs in the near future. Retaining a lawyer from cradle to grave is out of budget for this litigant. What to do? Relief is around the corner – a lawyer steps in to help solely with the hearing, the result is fair, and the cost is affordable. Success stories like this are playing out across the profession. The unbundling of legal services, also commonly called limited scope representation or a limited scope retainer, is expanding the legal market and at the same time one of the cornerstones of access to justice. Lawyers “unbundle” the full service package to provide a particular legal service, be it consultation, ghostwriting, or appearing in court, and leave the rest to the client. Clients that may otherwise be unable to afford a lawyer for full representation can now meet the legal system halfway with the assistance of a lawyer. While perhaps most popular among family law practitioners, limited scope retainers are making headway in many areas of law, including administrative law, corporate law, and civil litigation. An entrepreneur buying a small business may approach a lawyer to scrutinize an already-negotiated contract. 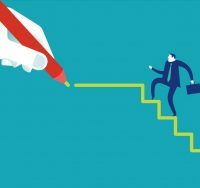 A recently fired employee can consult a lawyer to get information on what constitutes an acceptable range for a severance package, then work out the details with the employer alone. A “small” transactional dispute over the quality and quantity of widgets can be canvassed with a lawyer before digging in. The list of possibilities is long, and much of the market may yet be untapped. Clients, opposing counsel, judges and adjudicators report that, for the most part, they are happy with limited scope retainers. The clients are satisfied because they get help; judges and adjudicators deal with better-informed self-represented parties; and opposing counsel is happier dealing with a self represented person who has had the benefit of a lawyer’s input. While there are clearly benefits to limited scope representation, what about the risks for lawyers? There are two major risks. First, communication-related claims, which are the highest source of claims in virtually all areas of law, are equally if not more likely to occur under limited scope representation. This typically happens when there is a disagreement between what the lawyer and client have agreed to do. Was work promised but not done? Did the lawyer take steps to which the client never consented? A limited scope retainer that fails to draw the lines clearly – or fails to follow the lines drawn – can lead to a malpractice claim. Second, limited scope representation presents a risk that lawyers may not dig deep enough and ask appropriate questions on a matter. The failure to undertake adequate investigation is another leading cause of claims. In the context where only some legal work is provided, it may be tempting to cut short a client interview once the paid-for time has run out. If the lawyer discovers any impending deadlines or limitation periods, they should be disclosed and, preferably, confirmed in writing. The interview with the client must be done as carefully as it would be for a client with full representation. If not, remember that lawyers who fail to warn their clients of material legal issues or claims, even where they were not part of the limited scope retainer, have been held liable for malpractice. Rule 3.2-1A of the Rules of Professional Conduct “Legal Services Under a Limited Scope Retainer” imposes new obligations for lawyers acting under a limited scope representation. The lawyer must advise the client about the extent and scope of the proposed services, and whether they can be provided within the financial means of the client. The client must be fully informed of the risks and disadvantages of limiting the scope of the representation. If the client is unfamiliar with the legal system, extra care should be taken to ensure the client truly understands the limits and the risks. The claims experience in the U.S., where limited scope representation has been more common, indicates that dissatisfied clients will allege negligence. Examples include alleging the lawyer was authorized to undertake certain steps but failed to do so, the fees were unreasonable given the limited scope, the litigation result should have been better, or that one or other aspect of the matter was not handled properly. The bottom line: A higher likelihood for malpractice claims and ethics complaints when the risks and disadvantages are not discussed. Taken in conjunction with “Competence” commentary [7A] to Rule 3.1-2, the lawyer must carefully assess whether it is possible to render legal services in a competent manner. Simply providing a limited legal service on the basis that the client can only pay a certain amount poses a risk if it means the lawyer is unable to provide competent services. Is it competent service to shrink a consultation requiring three hours into only one hour because that is all the client can afford? Is it competent service to attend a court hearing without the benefit of a factum because the client cannot afford to pay for a factum? The risk of a malpractice claim increases when the lawyer is unable to spend the time necessary to provide adequate service. Be careful with communications when opposing counsel is acting on a limited scope representation. Is opposing counsel on the record? If so, you must communicate through counsel. Otherwise, clarify whether you are to deal with the client or the lawyer, depending on the issue. Consider the circumstances in which you should deal with opposing counsel. It can help opposing counsel if you provide written notice clarifying the extent to which you are acting and what aspects of the matter opposing counsel should communicate with you on, versus those aspects being handled by the client. Similarly, if you are acting on a limited scope retainer and a tribunal is confused about your role, do not mislead the tribunal, and consider whether the circumstances and rules of practice require you to disclose the scope of your retainer. Commentary [5.2] to Rule 3.2-1A.1 states that a lawyer must carefully consider and assess whether it is possible to provide competent services to a client with diminished capacity. A client who is a minor, mentally disabled, or otherwise impaired, may not be capable of understanding the risks and disadvantages of a limited scope retainer. Take care when considering a limited scope representation with such clients. If you choose to offer limited scope representation, there are steps you can take to minimize risk. Work out the discrete legal steps the client needs to achieve. Confirm the steps that are within your wheelhouse. Advise the client about the risks and disadvantages of the limited scope. And control the client’s expectations from the start of the matter. Next, it’s time to put it all in writing. Rule 3.2-1A.1 requires the lawyer to confirm the services in writing and to provide a copy to the client when practicable. 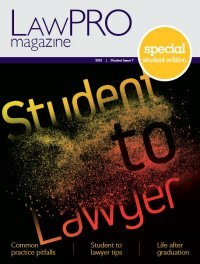 LawPRO has a limited scope representation resources page at practicepro.ca/limitedscope on the practicePRO website. The resources include tips and checklists to help you, handouts for your client, and sample limited scope retainers and clauses. At practicepro.ca/retainers, you will find updated precedent retainers. The retainer should identify the discrete collection of tasks to be undertaken, and who is responsible for which tasks. Once you’ve begun work on a limited scope representation file, document every step of the matter. Keep a record of all communications, especially information and instructions provided by the client, and advice you have given. When a step has been completed, confirm that the work was done at each step. When you have completed work on a limited scope representation, there is a chance the client will return to you with more questions or steps that need to be done. If this occurs, make sure you have a new retainer in place. This may be hard to do as the inclination is to want to step in and help. However, should you skip obtaining a new retainer, you may have difficulty collecting payment for the extra work, and you will lose the protection that comes with documenting the steps. Be aware of the risks of limited scope representation. Protect yourself by only providing limited scope representation in circumstances where you can do so competently. Clearly set client expectations from the beginning on what you will do. Use a written retainer. Document the file. And don’t do work after the retainer is terminated, unless you create a new retainer agreement. These basic steps can help reduce your exposure to a malpractice claim, and help you defend a claim if an allegation of negligence is made. Ian Hu is Counsel, Claims Prevention and practicePRO.